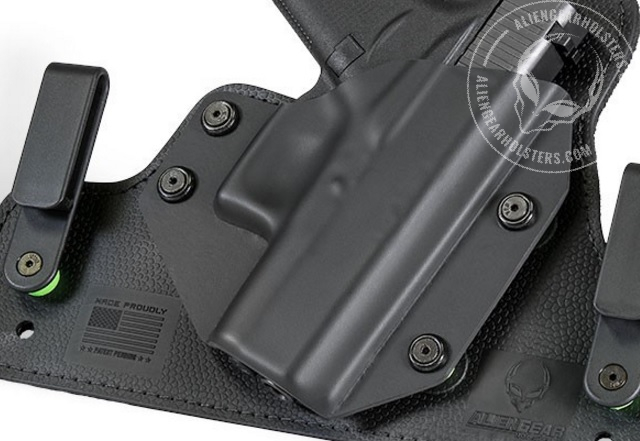 The standard for concealed carry is the IWB holster, or inside the waistband. These holsters tuck inside the waistband and are easily covered up with a shirt, whether tucked in or not. The easy concealment makes them the default choice for concealed carry, but not every IWB holster is the same. There are a number of things a person should know about inside the waistband holsters in terms of materials, construction and use, especially before buying one. Pancake holster: a pancake holster is made from two layers of some sort of material, which is usually leather, strong plastic like Kydex or Boltaron, or nylon cloth. Hybrid holster: hybrid holsters feature a durable plastic retention shell mated to a cloth or some other composite backer. Often enough, the backer can be made from leather, nylon or some sort of composite backer made of several layers of materials. 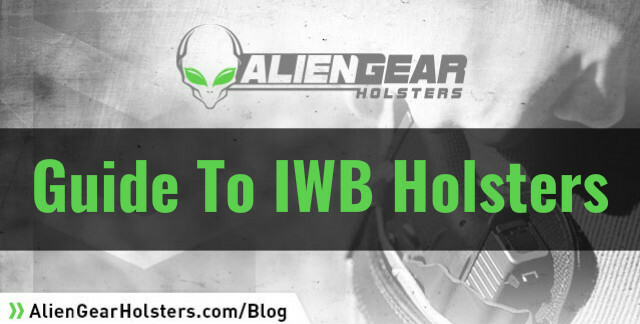 The same holster materials used in OWB holsters are used to make IWB holsters. The dominant materials are nylon cloth, durable plastic and leather. Each has their benefits and drawbacks. Leather IWB holsters can achieve a tight fit...at first...and can be quite comfortable. However, depending on where the belt clips or loops are located, can put a lot of weight in a small area. They also are quite warm in hot weather and can absorb a lot of sweat, which can lead to the holster acquiring a sweaty smell. Leather also softens enough during its lifetime to lose retention. Durable plastics, like injection-molded nylon, Kydex or Boltaron, are usually very durable and are often precisely molded for a specific make and model pistol. Not all are, however. Furthermore, pancake holsters of this construction are not the most comfortable to wear inside the waistband. Nylon and other cloth holsters are not generally made for a specific make and model firearm; they are usually made for a certain range of sizes of pistol. 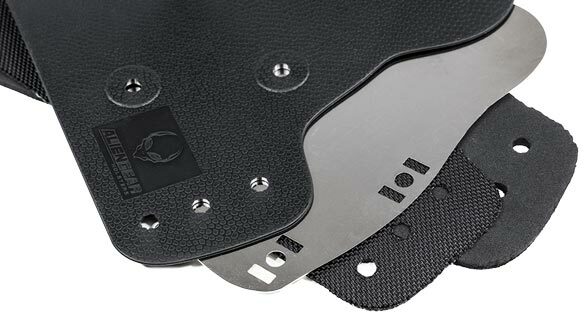 As to backing materials for a hybrid holster, leather is very common. It takes time to break-in and wear comfortably in most cases. Some companies skimp on leather thickness, which is lighter but can feel flimsy as the leather wears in. Thicker leather backers are generally more comfortable, but can get quite warm in hot weather, which some people don't appreciate. In recent years, neoprene has emerged as a backing material. Neoprene is a soft, sponge-like material that can be quite comfortable, but can also sop up moisture if open-cell neoprene is employed in this role. Closed-cell neoprene, however, repels moisture, which would be the preferred type of neoprene for use in a holster backer. The number of features of an IWB holster depends on the design of the holster. Some have few features, some have many; it all depends on who makes it. Belt clips or loops are one of the most common features people look for. Holster belt clips come in a few different forms, but a simple clip is most common and is usually either plastic or metal. You might think metal clips will be stronger, but you'd be surprised; depending on the quality of the metal clips, they can deform easily. Plastic clips can as well, again depending on how they're made. Also, some clips are designed for easier deep concealment. For instance, some clips - which are called C-clips or J-clips - are designed to let the belt slide over the clip. When on the belt line, these clips practically disappear; they're only observable to people who know what they're looking for. Tuckability is another feature to look for. Some holsters allow a shirt to be tucked over the holster, further concealing the gun. Look for space between the belt clip and the holster itself; that's where the shirt will fit when it's tucked in. Clip or loop placement is also something to consider. Older IWB designs, such as a leather pancake with two closely-spaced loops, will put the weight of the handgun in a small area, which you will notice while carrying. However, this effect is mitigated by carrying a lighter pistol. The "winged" IWB design does spread the weight out a little more, though. Another feature related to the belt clips is adjustable cant angle, or the angle at which the grip sits. A forward cant aids in concealment, and also make drawing from concealment easier while seated. Holster retention is also a feature to look for. Very few IWB holster feature active retention devices, so passive retention is going to be more common. Passive retention is natural resistance to a pistol coming out of the holster, which comes in the form of the natural pressure imposed by the holster itself and certain features built into some holsters, such as a bump that protrudes into the trigger guard. Not all holsters, though, have adjustable retention. Hybrid holsters can have one or more retention screws, which tighten the holster shell onto the base. Some IWB pancake holsters will likewise have a retention screw that tightens the holster down. Backing materials are another feature to look for. Leather is great during 3 of the 4 seasons. Leather thickness is a double-edged sword, so to speak; the thicker it is, the greater the comfort but that also means longer break-in time and it will be even warmer during the hotter months. 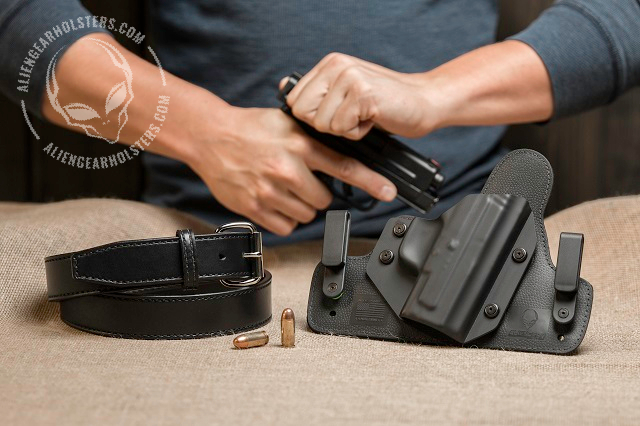 Multi-layer holster backers will often have a comforting backlayer, but can feel bulky inside the waistband. Some people find such designs off-putting as a result of the perceived bulk, but a lot of people find the perceived bulk is worth dealing with once the comfort factor is taken into account. One of the first things to look for when shopping for an IWB holster is comfort. The truth about concealed carry holsters is that this aspect makes or breaks them. If it isn't comfortable for you to wear, you're going to find reasons not to and as a result, you need a comfortable holster. As to belt clips, consider how you'll use it. Do you need clips that won't show much with your shirt tucked over the holster because of how you dress most days? Then look for a holster that comes with J-clips or C-clips; these will tuck under the belt and your holster will become almost impossible to detect, especially if you have black clips with a black belt and trousers. While not essential, adjustable depth and cant settings are good to have. Some need a holster to ride a little higher, some a little lower. Your mileage may vary, so to speak, so being able to adjust the holster in this manner is beneficial. 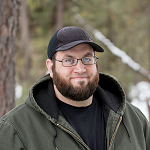 As to retention, adjustable retention is desirable as holsters move and twist and stretch and so on as you do. Thus, some loosening can occur. Leather holsters will start off with perfect retention, but can be almost too loose within a few years. Therefore, adjustable retention is a good idea as you can adjust it as you go but you can also set the draw to your desired setting. Some like a tight holster, some prefer it a little looser. Bear in mind also that the fit impacts retention. 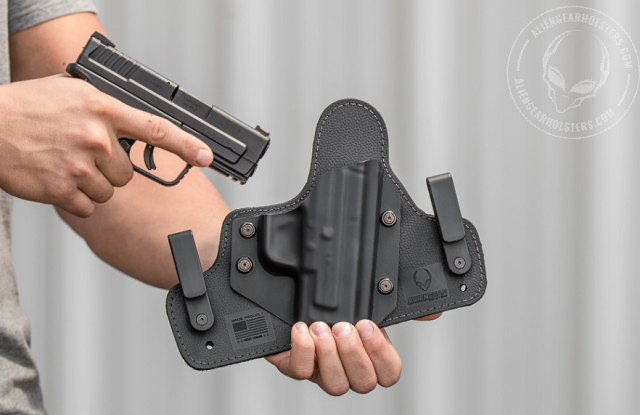 A holster that fits exactly will offer a lot of retention compared to one that doesn't.